Fledging African LCC group fastjet is planning to accelerate expansion over the next 18 months with several new international routes from its original base in Tanzania and the launch of three new affiliates. The expansion is risky and ambitious but is necessary as the group currently lacks the scale to be sustainable. fastjet has not added a single aircraft in 18 months – an unusually long time for an LCC start-up. The group now plans to expand its fleet from three to 13 A319s by the end of 2015. Further growth is expected in 2016 and 2017 to a total of 24 aircraft as planned new affiliates in Zambia, Kenya and South Africa expand. fastjet could quickly become Africa’s largest LCC brand but will have to overcome multiple challenges, including potential regulatory hurdles, which have so far stalled its progress. fastjet launched services in late Nov-2012 with a fleet of two A319s serving the Tanzanian domestic market. It added a third aircraft by the end of 2012 but has since repeatedly delayed fleet expansion due primarily to regulatory setbacks in trying to expand its international network and portfolio. The group’s fleet plan initially envisioned 15 aircraft and multiple bases by the end of 2013.
fastjet has essentially lost two years as the group’s latest business plan envisions 13 aircraft and four bases by the end of 2015. A second base in Zimbabwe with an initial fleet of two A319s is expected to be opened by the end of 2014. The new three-year business plan envisions two more aircraft for Tanzania in 2015 along with the launch of new three-aircraft bases in the larger markets of Kenya and South Africa. The slower than anticipated expansion over the past 18 months have been costly and disappointing. fastjet reported on 26-Jun-2014 an operating loss before exceptional charges of USD48 million for 2013, including a loss of USD22 million at fastjet Tanzania. The remaining losses were incurred in Angola, Ghana and Kenya – where the group until recently operated regional aircraft under the brand fly540. Including exceptional items, which were mainly related to aircraft impairment charges at fly540, fastjet incurred a group operating loss of USD79 million in 2013. Group operating and net losses have exceeded USD130 million since mid-2011 while total revenues have been only USD74 million. Revenues in 2013 were USD53 million, with about half from fastjet Tanzania and half from fly540. fastjet on 24-Jun-2014 sold its stake in fly540 Kenya. The divestment enables the group to focus on the fastjet brand and a pure LCC model as operations were suspended at fly540 Angola in Apr-2014 and at fly540 Ghana in May-2014. Smaller fly540 Uganda and fly540 Tanzanian ceased operations previously. fastjet initially acquired a stake in the fly540 group in mid-2012 as part of a deal with Lonrho Aviation, which took a majority stake in London-listed fastjet but exited as a fastjet shareholder in 2013. fly540 has always followed a regional hybrid model operating turboprops and small jets. fastjet is aiming to re-enter the Kenya market in 2015 with a new local partner and duplicating the model it has used in the smaller Tanzanian market. The group concluded converting and re-branding fly540 Kenya into an LCC was not economically viable. fly540 Kenya will continue to operate without fastjet involvement while fastjet works towards establishing a new entity in Kenya. 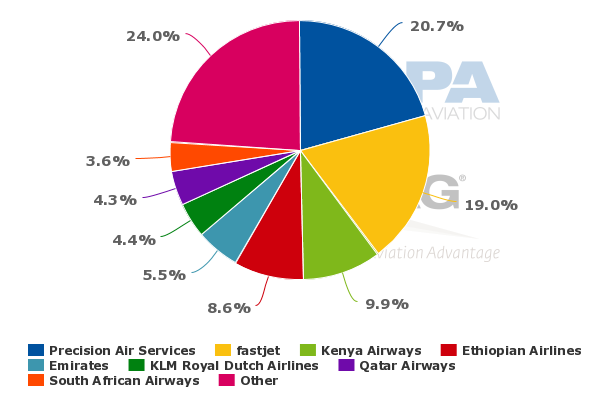 The group will continue to evaluate re-entering Angola and Ghana using its A319 fleet and the fastjet brand but for now the focus is on Kenya, Zambia and South Africa. Zambia emerged in early 2014 as the planned second fastjet base after Tanzania. As CAPA previously analysed, the Zambian market is relatively small but has potential and is much less competitive, with fewer obstacles to entry than the other African markets fastjet has been looking to enter. fastjet Zambia initially aimed to launch services in mid-2014. As has been the case with almost every fastjet project, the venture in Zambia has encountered delays. But fastjet CEO Ed Winter told CAPA that the new carrier still aims to launch both domestic and international services by the end of 2014. Mr Winter says the group is now looking to source two A319s for fastjet Zambia. His preference is aircraft which are between seven and nine years old. fastjet Tanzania’s three existing A319s are between 10 and 15 years with an average age of 13.3 years, according to the CAPA Fleet Database. fastjet Tanzania is operating CFM56-powered A319s but Mr Winter says the group is open to also leasing IAE V2500-powered A319s as having two engines in two different bases would be manageable. Mr Winter says fastjet Zambia’s launch and the lease of the initial two aircraft will be contingent on securing approvals to operate international flights. There is some potential to stimulate demand in the Zambian domestic market, which is currently only served by small regional carriers. But fastjet only expects significant traffic on one domestic route, Lusaka to Ndola, which is now served by a few daily turboprop flights and a few hundred daily buses. The international market is absolutely critical for the franchise to be viable. While fastjet has received a warm reception from Zambian authorities, fastjet Zambia will ultimately need approvals from foreign countries. 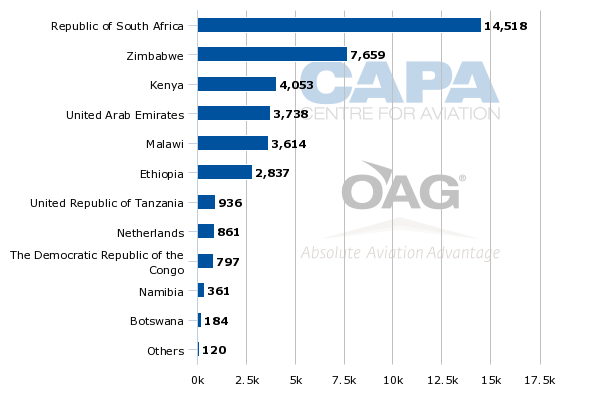 South Africa is the most important as South Africa is Zambia’s largest market, accounting for about 37% of total international seat capacity. There are available traffic rights for Zambian carriers as the Zambia-South Africa market is now dominated by South African carriers, which account for all 14,500 of the current weekly seats between the two countries. But as fastjet Tanzania encountered, securing approvals from South African authorities can be a long and tedious process even once designated for the route. fastjet Tanzania encountered multiple delays in entering Johannesburg, which it finally began serving in Oct-2013 – several months after initially planned. Lusaka is expected to be relatively small base, having been allocated only three of the 24 aircraft in the group’s projected fleet for the end of 2017. The third aircraft is slated to be added in 2016. Ndola, Johannesburg and Harare in Zimbabwe may end up being the only main routes. There are several other potential low frequency routes. Lusaka is already linked with Dar es Salaam by fastjet Tanzania. fastjet believes a three-aircraft base is sufficient as fastjet Zambia will be able to leverage the resources of the broader group including IT and distribution. The group also does not plan to have maintenance activities and a full complement of spare parts at every base. fastjet expects Zambian authorities will be flexible in allowing the wet lease of aircraft from other fastjet entities to cover when one of the aircraft in the small Zambian-registered fleet is not operational or out for heavy maintenance. The Zambian government is keen for LCCs to enter as its market is currently not served by any LCCs. Zambia also does not have any foreign ownership requirements, which has enabled fastjet to apply for an air operator's certificate as a 100% foreign owned entity. But Mr Winter says fastjet prefers to secure a local Zambian partner by the time the new carrier is launched. fastjet has been talking to several potential partners in Zambia which would have a combined 30% to 40% stake. fastjet also recognises Dar es Salaam will remain a relatively small base. The group’s new fleet plan envisions three additional aircraft for fastjet Tanzania – two in 2015 and one in 2016 – for a total of six aircraft. Mr Winter believes fastjet Tanzania can be profitable even with just three aircraft by improving aircraft utilisation rates. The carrier has been under-utilising its three A319s since they were delivered in late 2012 due to delays in expanding its international operation. fastjet Tanzania is aiming to increase its average utilisation rate from only 5.7hrs in 1Q2014 to 11.7hrs by the end of 3Q2014. The utilisation rate has already improved as the carrier added a third daily flight in 2Q2014 on Dar es Salaam-Mwanza and a second daily flight on Dar es Salaam-Mbeya. Its third domestic route, Dar es Salaam-Kilimanjaro, was upgraded on 30-Jun-2014 from 14 to 16 weekly frequencies. fastjet Tanzania also currently operates two international routes, Dar es Salaam to Johannesburg and Lusaka, with three weekly flights each. Harare in Zimbabwe will become the carrier’s third international route on 5-Aug-2014, when two weekly flights are launched. In May-2014 fastjet Tanzania reported an 11% increase in capacity compared to Apr-2014 and a 68% increase compared to May-2013. Yields also have been steadily improving, with average fares nearing USD100 in late 2013 compared to about USD50 in early 2013.
fastjet is confident it has sufficient yields to be profitable once utilisation rates exceed 11hrs, which will allow unit costs to be reduced to a sustainable level. fastjet expects to reduce its fixed cost per ASK by 53% and total cost per ASK by 27% by the end of 2014. But fastjet Tanzania’s planned increase in average aircraft utilisation – and expectation to become cash flow positive by the end of 2014 – hinges on several new international routes launching. fastjet Tanzania is seeking to launch services to Nairobi in Kenya, Entebbe in Uganda and Lilongwe in Malawi by the end of 2014, giving it up to six international routes. fastjet generally has the traffic rights for these routes but the process of securing foreign approvals have been painfully slow. Protectionism prevails across most African governments. The Tanzanian market is large enough to support several international routes with low fare stimulation. But the group will only move forward on expanding the fastjet Tanzania fleet, including the plan for two additional aircraft in 2015, if it succeeds at securing the required authorities to continue expanding the international operation. While it has so far expanded very slowly, fastjet Tanzanian believes it has proven it can stimulate demand with low fares, giving the group confidence it can duplicate the formula in other countries if given an opportunity. Despite the 68% surge in seat capacity in May-2014 fastjet Tanzania was able to grow passenger traffic at an even faster rate and improve its load factor by 4ppts to 71%. 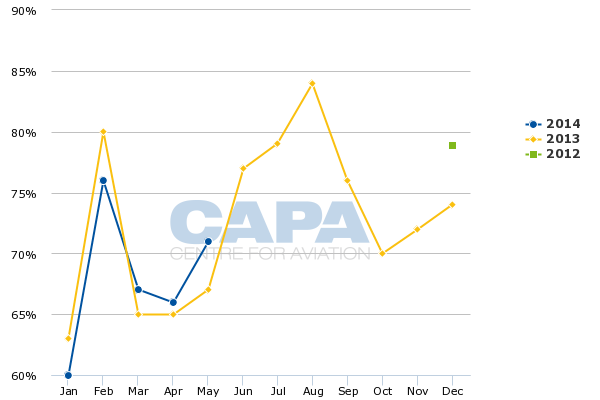 The carrier’s load factor has been up on a year over year basis for three consecutive months. fastjet currently has about a 19% share of system-wide seat capacity in Tanzania, making it only slightly smaller than Tanzanian full-service carrier Precision Air Services. fastjet stated in its 2013 earnings report that domestic competition has intensified in recent months as a result of “irrational pricing behaviour from both Precision Air and Air Tanzania” but does not believe this is a long-term threat. Air Tanzania and Precision Air both only operate regional aircraft and are primarily domestic operators. Air Tanzania currently operates international services to Burundi and Comoros while Precision Air serves Comoros and Kenya, according to OAG data. While the Tanzanian market is relatively small fastjet should soon become the largest carrier in the market. Mr Winter believes fastjet Tanzania could eventually transport 20 million passengers per year, arguing that this could be achieved with – rather optimistically – one in every 10 Tanzanians flying twice per year. fastjet says 38% of its passengers in its first five months of operations in Tanzania were first time fliers and believes with its low fare structure about 10% of the Tanzanian population can afford to fly. While its first 19 months of operations has been highly unprofitable, the carrier believes it has proven there is an appetite for low fares and that it has seeded the market sufficiently to add capacity on its existing routes and launch several new routes. The South African and Kenyan markets are much larger but provide a different dynamic in that they already have large existing players and an LCC presence. fastjet also previously looked at Nigeria, another large African market, but Nigeria along with several other countries that have been evaluated (such as Angola and Ghana) is not a short-term priority. South Africa has been high on fastjet’s hit list since the group was established and fastjet South Africa was close to launching in mid-2013. The project has been repeatedly delayed but fastjet continues to believe a franchise in South Africa, Africa’s largest market, is a necessity for it to succeed in its mission of becoming Africa’s leading LCC player. The group now aims to launch fastjet South Africa in 2015 with an initial fleet of three aircraft. It has allocated fastjet South Africa seven of the 24 aircraft in its three-year fleet plan, which is more than Tanzania or Zambia but would only give fastjet about a 15% share of the domestic market. fastjet expects its South African carrier will only operate domestically as it recognises international traffic rights will be almost impossible to secure because for most of South Africa’s international markets are already fully allocated, with South African Airways (SAA) likely to secure any additional rights that become available. fastjet instead plans to serve South Africa’s international markets using its other affiliates, starting with Tanzania and Zambia with Kenya and potentially Angola and Zimbabwe to follow. The domestic market alone is easily large enough to support a franchise in South Africa, where the group sees an opportunity to stimulate demand because the existing two LCCs – SAA subsidiary Mango and Comair subsidiary Kulula – have relatively high fares. The 2012 demise of LCCs 1Time and Velvet Sky have left SAA/Mango and Comair/Kulula with a duopoly. If fastjet does not quickly enter someone else will fill the void. In Kenya, Kenya Airways subsidiary Jambojet became the country’s first LCC in Apr-2014. Jambojet has so far been used by Kenya Airways to take over unprofitable domestic routes, using aircraft from Kenya Airways. fastjet is confident it can come to the market with a lower cost structure and stimulate demand in both the domestic and international markets. fastjet Kenya aims to launch services in 2015 with an initial fleet of three aircraft. Its fleet is slated to grow to eight aircraft – making Nairobi the largest of all the fastjet bases – by the end of 2017. The new fastjet business plan is undoubtedly ambitious. Launching three affiliates within a year will be costly and risky. fastjet will face a potentially vicious competitive response as it enters new markets, particularly in South Africa and Kenya. As was the case in Tanzania securing an AOC is a relatively easy task compared with the hurdles and bureaucracy it will need to overcome as it tries to launch more international routes – routes which in most cases are monopolies or near monopolies for protected flag carriers. But fastjet has learned a lot of valuable lessons in establishing and (very gradually) growing fastjet Tanzania and is eager to apply those lessons to other African countries. It also believes African governments are starting to now warm up to the benefit LCCs can bring to improving access and growing local economies. fastjet is also confident it has sufficiently proven the success of its model to secure the capital required to expand – which will in turn give it the scale needed to turn the corner and establish a sustainable business. fastjet secured in 2Q2014 USD25 million in capital from new investors, giving the group some bigger name institutional shareholders alongside easyJet founder Stelios Haji-Ioannou. But ultimately the group will need more capital – a lot more – from institutional investors as well as local partners in Africa. Even if fastjet Tanzania becomes break even – which would be a big accomplishment given its profit margin in 2013 was about negative 90% – it will likely be at least a couple of years before Kenya, South Africa or Zambia are profitable. There can be no doubt that in Africa's arthritic market there are massive opportunities. With three underutilised A319s carrying about 40,000 passengers per month, fastjet has barely scratched the surface. It has a long road ahead as it tries to expand its portfolio to four franchises, which it expects will carry 6 million and generate USD 500 million in revenues by 2018.
fastjet is at a critical juncture. It needs to expand to reach a sustainable scale but there is a risk that it will run out of capital as its expenditures increase significantly. The potential of LCCs in the African market is enormous. If fastjet plays its right cards over the next years it has the potential to emerge as the region’s LCC leader and pioneer, securing first mover advantage as the market inevitably opens up.